LDV is one of the nation’s favourite commercial vehicle brands for producing high-quality models that can meet the demands of all purposes and deliver a reliable performance. New to the marque is the impressive EV80 model, with electric transmission. 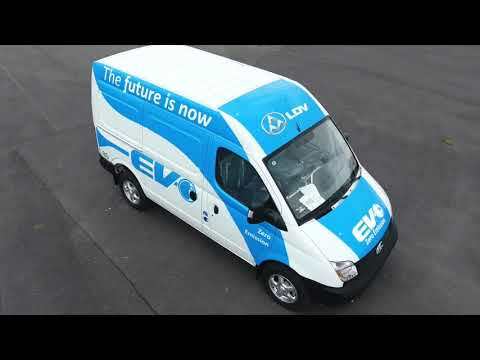 With an EV80 Electric Vehicle from LDV, you can save significant amounts in fuel, and benefit from new technology that transforms your everyday drive. Spacious and able to cope with significant demands, the EV80 has a payload of 950kg in the LM-VAN model, and 900kg in the chassis cab. The exterior boasts electric and heated side mirrors, and a single sliding door for easy access. At the rear, the door can open to 255 degrees, while the non-slip entry steps and low cargo floor height and area illumination allow for an easy and straightforward function when at work. Inside the EV80, drivers and passengers can enjoy optimum comfort with air conditioning, and be entertained by the FM/AM radio and MP3 player for your music or other. The dual bench comes with a head rest for up to three passengers, while the driver can enjoy an arm rest and a seat that is adjustable eight ways. The new EV80 has zero emissions. Plug in the model with its combo Connector Type and you can have a fully charged high-capacity lithium battery in just one hour. This model can travel up to 130 miles before it needs charging, and you can enjoy the high-powered technology of 122bhp and 320Nm of torque. Purchase or lease the new EV80 and enjoy five years of warranty and roadside assistance – making sure that you have peace of mind with every drive. You can also benefit from flexible finance plans that cater to your budget at West Midlands Hire. We are experts in commercial vehicles for trade, so we guarantee to help you find a model that meets your requirements.